Breach of Consciousness is a psychological thriller written by Peter Castillo. Fourth-grader Marco Torres was determined to be one of the guys, but the stabbing migraine headaches that afflicted him made it hard to keep up the act. This was especially true when it happened while they were riding bikes and the pain made him pass out. His friend, Randy, knew about the headaches and helped Marco research migraines to find out what was happening and what he could do about it. Most migraines, he learned, last about four hours, while his were maybe about a minute in length. Was it a tumor? While Randy suggested he go see a doctor, Marco was not convinced that was the answer. Then a drunken homeless man accosted him in the street and spoke into his mind. How had he done that? While he wondered, the police came up and arrested the man, who they called Seymour. He had thrown a rock through a shopkeeper's window for calling him a name, but the thing that stood out for Marco in the account was that the shopkeeper hadn't spoken aloud. Marco thought hard and spoke to Seymour, asking what he was, but Seymour answered that he didn't know. Whatever had just happened, however bizarre, seemed to signal to Marco that the headaches and other strange things that had happened to him were some sort of incomprehensible psychic phenomenon. 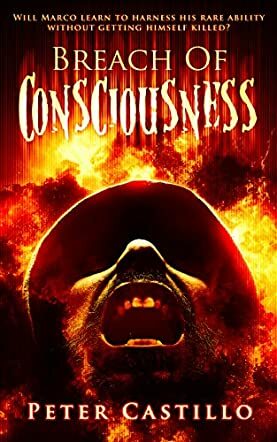 Peter Castillo's psychological thriller, Breach of Consciousness, examines the impact that psychic abilities can have on those who have the gift as seen through the experiences of aspiring author, Marco Torres. While he had the support structure of his mom and dad at first, his mom's untimely death and dad's overwhelming grief afterwards leave him adrift, except for the uncle who counsels him to join the Navy and provides him with a home. Castillo's plot is credible and moving, and seeing how Marco makes a life for himself in San Diego and finds mentors who have similar gifts is a grand experience. From the body builder at the open-air gym and the psychics on the boardwalk to the mysterious blind man who stalks Marco and his mentors, the author peoples his tale with authentic, living characters. Marco's visit to the haunted hotel room on the tenth floor is eerie and genuinely spooky and ramps up the atmosphere of this entertaining and fast-paced novel. Breach of Consciousness is a brilliant and probing debut novel, and it's most highly recommended. Breach of Consciousness by Peter Castillo is a uniquely sculpted thriller, the kind of story that will entertain and have readers in its thrall. During his early years, Marco Torres suffers from unusual and sporadic migraines and they set him apart from his mates. Anxious and desirous of finding out the reason behind the migraines, the young Marco undertakes research, but doesn’t grasp what is happening to him. He will be afflicted by the same phenomenon as he grows into adulthood, only this time he has visions of a homeless man. Becoming a writer and serving in the Navy don’t offer a moment’s respite. But when Marco meets a couple with a similar problem, a new path opens before Marco and, teamed with the couple, he has to solve a murder. But the question is: Does he have the strength to handle his extraordinary gift? “Our gifts are our crosses” is a saying I have heard many times, one I have grown up to believe in, and this book seems to corroborate this message in a very succinct and powerful way. It seems one of the key themes of the book is self-exploration and what happens when we accept who we are, weird as we could be. Peter Castillo is a great storyteller and I enjoyed the way he used the first person narrative, the ability to draw readers into the narrator’s worldview and perception of reality without sacrificing the point of view of other characters. Character development seems to be one of the author’s fortes, and watching the protagonist grow from a troubled young man unable to understand his gifts, to a confident adult harnessing his skills for a purpose will be very rewarding to readers. Breach of Consciousness is a well-written and polished work that is highly entertaining. I won’t hesitate to recommend this one for its insightful life lessons and entertainment. An unusual thriller with a beautiful message of hope. In Breach of Consciousness by Peter Castillo, we meet seven-year-old Marco, a boy in Chicago who experiences strange migraine spells. Soon he starts having visions of a bizarre man who claims they have something in common. With his visions intensifying and realizing that there is something not normal about him, Marco tries to live an ordinary life, eventually working for the US Navy. Deciding to become a writer, Marco quits his job and moves to California where he meets Marie whose mother makes a living as a psychic. He also reconnects with his old school friend, Vicky. As Marco starts a new life, he is followed around by a mysterious couple. Events escalate and he is forced to face his abnormality, but there is a price to pay. Breach of Consciousness tells the story of Marco, a reluctant psychic who tries his best to live an ordinary life. Afraid to become an outcast in society, he tries to ignore his visions and telepathic powers for as long as he can. Peter Castillo’s writing style is simple and direct and, as such, it is as if Marco is speaking to readers personally. Narrated in the first person perspective, the story comes out astonishingly real and vivid. And as we follow the twists and turns of this narrative, we also come to realize that having psychic powers is both a privilege and a responsibility. Breach of Consciousness proves that real psychics are people too, like you and me, and they are somewhere out there trying to lead a normal and meaningful life. Breach of Consciousness by Peter Castillo is a thrilling story about a family that suspects their son Marco is different from other children because they overhear him reading in his room one day. The odd thing about it is Marco's lips weren't moving. The couple chose to ignore the incident and raised Marco like all the other children, until Marco started to talk to people about a man lurking around. An incident in the pool gets Marco kicked out because he makes an accusation that there is a man at the bottom of the pool. After the pool is emptied, it is discovered that there is actually no one there and Marco feels foolish. Marco is determined to figure out what is going on in his life, and he attempts to research telepathy with little success. As the years roll by, Marco goes to live with his father as a result of his mother's death. Everything appears to be going well until his father remarries and he is asked to leave home. Marco took that opportunity to enroll in the Navy boot camp in San Diego in an effort to clear his mind and work more on his writing. The part of the story about Marco reading in his room intrigued me because I would have freaked out as a parent, but it didn't seem to bother Marco's parents that they could hear his thoughts in his mind as he read. This story is very suspenseful because each chapter is a build up of questions. I enjoyed Marco's determination to figure out what was going on in his life. This story had a few shocking moments throughout the narrative, and it was very well written. Peter Castillo’s Breach of Consciousness is a thriller about the struggles of Marco Torres, a wayward, somewhat aimless young man with telepathic powers. He and the people around him knew that he was different at a very young age. He pushed his strange visions and encounters aside until early adulthood, when his indescribable affliction intensified. His abilities eventually draw the attention of some very talented telepaths, a brother and sister team with decades of experience in the Central Intelligence Agency. Together they pursue a path of intrigue that includes murder, mystery, gangsters, and international crime. The best description of this novel is “intermittently fast-paced.” It is a story full of tense action scenes and dramatic conflict, punctuated by intermittent breaks as the characters escape into lounging and “hanging out” time to smoke marijuana and drink beer. Indeed, for my personal taste it has a few too many such incursions into aimlessness, sometimes to the point of interrupting the flow of the story and stretching the limits of believability. One wonders how very skilled telepathic agents can so easily walk away from matters of international and psychological intrigue and go to concerts and museums or to fire up the barbecue, sip beer, and watch a Dodgers game. But I find that my personal disconnect in understanding the personalities of the characters is contextual. In examining these characters that the author developed out of his own experiences and the Venice Beach / California lifestyle that he portrays, I realize that he has described them perfectly! They are exactly the characters that fit the author’s story. I am not a frequent reader of this genre, but Breach of Consciousness captured my attention and held it. I wanted to solve the mystery alongside Peter Castillo and his compatriots. All in all, it’s a solid effort and a very marketable story.